This daughter church of Stapleford St Helen was built on Antill Street in 1908, serving the south-west part of the parish. It consists of nave and chancel in one, vestry, porch, kitchen, and (recently added) toilets, with steps up to the large entrance, with a false gable above. 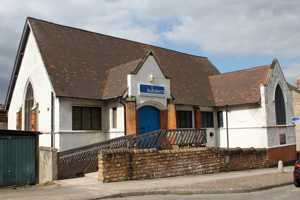 It was built on a sloping site allowing for a lower school hall. Of red brick, including brick buttresses, stucco and clay tiles, it is not peculiarly attractive externally but has been well modernised inside. Inside the seating was originally on pews but is now on chairs. The choir stalls face each other in the chancel. The altar, pulpit, and reading desk are of wood. There is a two manual organ. The original stone font was replaced by a moveable wooden one, which is now in use at St Helen’s. Also removed and installed at St Helen’s is the stained glass window erected as thanksgiving for the end of the Second World War. The church closed as a Church of England place of worship in November 2005 and is now used as The Haven Church and Community Centre.